Digging Deeper with God Fear of Failure: How to Overcome It! Have You Seen a Miracle? Meet with God. Grow in Faith. Fear of Failure: How to Overcome It! Inside: Fear of failure can stop you from starting what you were intended to do! God has a word for you! 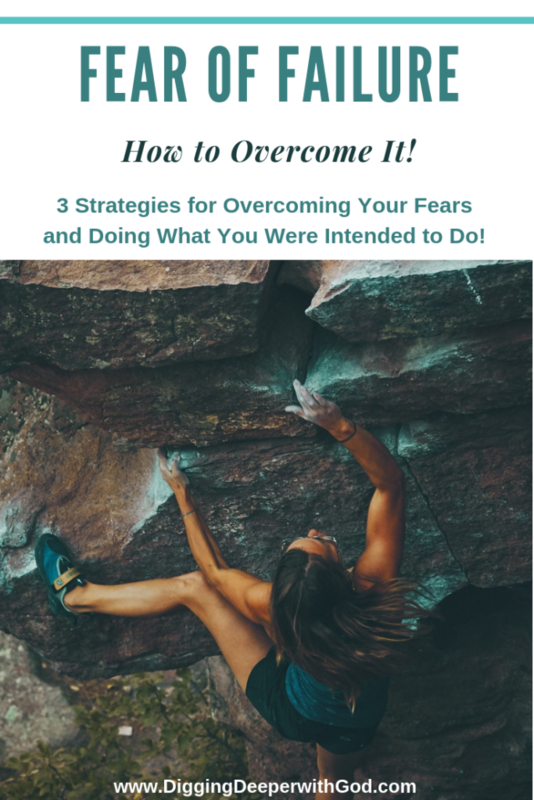 Look inside for 3 strategies for overcoming your fears! Who here has ever not started something because you were afraid it might not work out, you might not know how to do it, or you weren’t sure where to start? You felt overwhelmed and unsure, in short, because you might fail? Fear of failure might cause you to not try a new recipe when company is coming over (what if they don’t like it?) or agree to make a presentation at work (what if you fumble through your notes?). It might keep you from pursuing a new path of education (what if you can’t make the grade?) or step out in new relationships (what if they reject me?). Fear of failure is one of the main reasons people don’t start a weight loss or healthy living journey (what if it just proves I cannot lose the weight or run a mile? See the Extra Info below!). Articles on fear of failure abound, but rarely do they consider God’s take on it. And, yet, He has a lot to say about it! 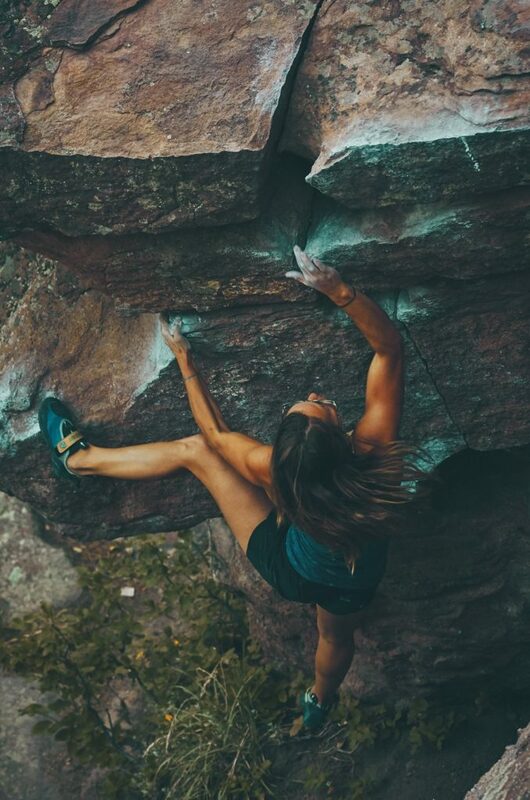 Fear is a pretty typical emotion, but fear of failure is when we allow fear to stop us from doing things that would help us to achieve our goals. We might even sabotage our own efforts because we are so afraid of what other people might think of us if we fail! It’s one thing if fear stops you from trying a new recipe or giving a presentation at work. It’s even worse if it keeps you from developing wholesome, fulfilling relationships or eating healthfully. What if fear of failure stops you from doing the most important things — the things God wants you to do? God has designed you for unique purposes that are important to His kingdom and for what He wants for the people around you! If your human fears are keeping you from doing kingdom tasks, it is time to take a look at how to move beyond the fear. The first step in moving forward God’s way is to seek God’s guidance. It is OK to make sure you heard His voice correctly! Remember Gideon with the fleece and the dew? God had asked Gideon to save Israel from the hand of Midian, and Gideon, being of the weakest clan in Manasseh and the least in his father’s house, wondered if the command was for real. Did God really want him to lead the effort to defeat the Midianites? Sure enough, it was really God’s voice, and God really did want him to do this very hard thing. Even before the fleece and the dew, Gideon talked with the angel of the LORD over a meal of meat, unleavened cakes, flour, and broth. When fire sprang up and consumed the meat and the unleavened cakes, and the angel of the LORD vanished, Gideon came to a new understanding: God really was asking him to do this mighty task! Now that you know God is asking you to do this thing, it is time to step out in faith. This is the hardest part! Remember, you have grounded yourself in the fact that God wants you to do this task you’ve felt nudged about. You now know that what God has asked you to do is ordained by Him. So . . . it is not because of your efforts that this goal will be accomplished! It is because of what God will do in you and through you. But it’s on Him. Got it? Yeah, I know, easier said than done! To prove the point that it was God’s battle, not Gideon’s, God had Gideon trim his troops from 32,000 down to only 300 men. (You can read about that in Judges 7.) That is quite a reduction in resources! Do you see God’s point? It’s the Old Testament way of saying, “My grace is sufficient for you, for my power is made perfect in weakness” (2 Corinthians 12:9 ESV). Yes, we are inadequate for many tasks. That is exactly the point. Only in God’s adequacy — His sufficiency — can we accomplish so many things that He desires for us! I am convinced that a good amount of my fear of failure is not trusting God with the outcome. 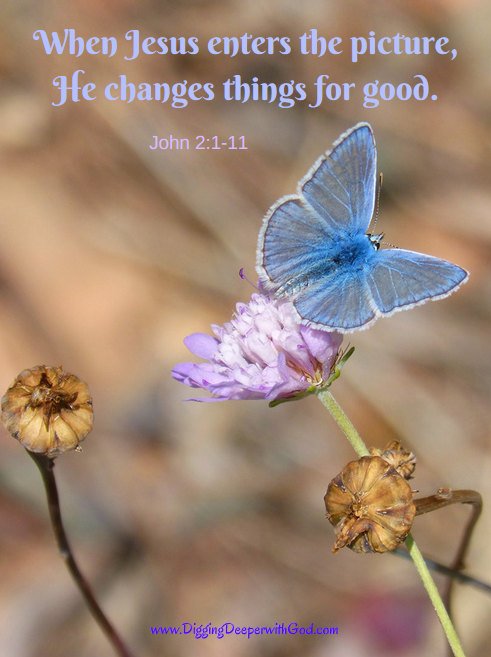 If God has asked me to do something, the outcome is not up to me; it is up to God! Oh, if I could only fully trust Him for every single thing and not take so much of the responsibility upon myself! That’s the real question, right? What if you do fail? This is an honest question, because just as success is part of living, so is failure, and at the root of fear of failure lies a host of buried questions: What will other people think of me if I fail? What if I am not capable or smart enough to pull off this thing? What if my failure hurts other people? Person after person in the Bible failed, and, guess what: Those who were walking with God finished with unsurpassed joy, because God had it! The status of the world was not dependent on their success! Let’s turn from Gideon to Moses. I know, this is a sharp turn back in time, so take a moment to adjust! Moses so did not want to go to Pharaoh to talk him into letting the Israelites leave the land of Egypt! He begged God to let him off the hook, but God made it clear: Moses was the person He had chosen for this humanly impossible task. Has God chosen you to do something, even if you don’t feel equipped? Really think on that! In God’s sovereignty, Moses experienced great success in leading the people out of Egypt. Through God’s guidance and leadership, Moses taught the people how to live beyond the shackles of slavery, worship God, and treat each other. Then in one disheartening moment, Moses branched out on his own, not following God’s command, and lost the reward of crossing into the earthly Promised Land. In frustration, he struck a rock to get water for the people instead of trusting God to provide the water. You can read about this in Numbers 20. See the Extra Info for more on this below! Let me tell you, that passage has always bothered me, and it still does . . . except MOSES RECEIVED SO MUCH BETTER! Centuries later, when Jesus was transfigured, showing His full glory to Peter, James, and John, who did they see with Jesus? That’s right: Along with Elijah, Moses was hanging out with Jesus in the Ultimate Promised Land. Yep! God did not forget His faithful servant! Not once, no way, Amen! Back in the desert, upon Moses’ death, God Himself had tenderly buried Moses (Deuteronomy 34) and welcomed him into the true land of milk and honey, where Moses’ fears of inadequacy and shaky leadership mattered no more, because he was covered in the redemption of God and His everlasting love! This we can hold onto: If we walk with God, seek His will, and follow His voice — even then, we may experience what seems like earthly failure. But Jesus’ promise to be with us to the very end of the age is certain and sure, and therein lies our great security! So, go on, brave out! Succeed! Fail! Look to God for everything, and He will guide you! What have you been putting off that God is calling you to do? If God says yes, move forward with trust. Trust God to cover your failures! Do you find yourself afraid of failing? Spend some time talking with God and listening for his voice. 1. Ask God to bring to mind something that He has asked you to do that you have put off. It might be as simple as writing a note of encouragement to someone or as big as starting a new venture. What is it? Ask God to reveal to you the reasons you have put it off. 2. Confess to God any reasons that seem to not be from the Lord. It is possible that He has told you that the timing isn’t right or that you need to learn more in order to take the first steps. But if you have a fear of failure that is rooted in a lack of trust in what God can accomplish, take time to confess those fears and your lack of trust. 3. Read Judges 6 and 7, or just one of those chapters! They are fascinating plot-based accounts. I promise you won’t be bored! Write down everything God says to you as you read those chapters. Worship and praise drive out fear. Let’s lift our hearts and voices in praise to God today! This article focused on fear of failure, but did you know there is also fear of success? If you are walking a weight loss journey, you might find this article on fear of success helpful! Join Us at Digging Deeper with God! Subscribe to receive these life-giving devotions by email! Join the Digging Deeper with God Community for Women on Facebook, where we encourage each other in our walk with the Lord! *Data from https://en.wikipedia.org/wiki/Michael_Jordan and https://en.wikipedia.org/wiki/LeBron_James#NBA_career_statistics. Get your 2019 Bible Memory Plan: The Psalms! Use it as a memory plan or a Bible reading plan. You'll also receive access to the Subscriber Library, giving you a host of free resources! My favorite is "How to Hear God's Voice in a Busy World." Disclosure: This page contains affiliate links. You can find my full disclosure at https://www.diggingdeeperwithgod.com/disclosure/.